This article is about the genus of flowers. For the myth of the youth Crocus who was turned into a crocus, see Crocus (mythology). For other uses, see Crocus (disambiguation). Crocus (English plural: crocuses or croci) is a genus of flowering plants in the iris family comprising 90 species of perennials growing from corms. Many are cultivated for their flowers appearing in autumn, winter, or spring. The spice saffron is obtained from the stigmas of Crocus sativus, an autumn-blooming species. Crocuses are native to woodland, scrub, and meadows from sea level to alpine tundra in central and southern Europe, in particular Krokos, Greece, on the islands of the Aegean, North Africa and the Middle East, and across Central Asia to Xinjiang Province in western China. The name of the genus is derived from the Greek κρόκος (krokos). This, in turn, is probably a loan word from a Semitic language, related to Hebrew כרכום karkōm, Aramaic ܟܟܘܪܟܟܡܡܐ kurkama, and Arabic كركم kurkum, which mean "saffron" (Crocus sativus), "saffron yellow" or turmeric (see Curcuma). The word ultimately traces back to the Sanskrit kunkumam (कुङ्कुमं) for "saffron". The English name is a learned 16th-century adoption from the Latin, but Old English already had croh "saffron". 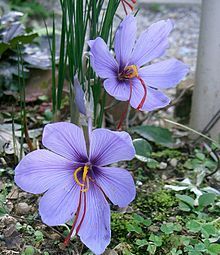 Cultivation and harvesting of Crocus sativus for saffron was first documented in the Mediterranean, notably on the island of Crete. Frescos showing them are found at the Knossos site on Crete, as well as from the comparably aged Akrotiri site on Santorini. The first crocus seen in the Netherlands, where crocus species are not native, were from corms brought back in the 1560s from Constantinople by the Holy Roman Emperor's ambassador to the Sublime Porte, Ogier Ghiselin de Busbecq. A few corms were forwarded to Carolus Clusius at the botanical garden in Leiden. By 1620, the approximate date of Ambrosius Bosschaert's painting (illustration, below), new garden varieties had been developed, such as the cream-colored crocus feathered with bronze at the base of the bouquet, similar to varieties still on the market. Bosschaert, working from a preparatory drawing to paint his composed piece spanning the whole of spring, exaggerated the crocus so that it passes for a tulip, but its narrow, grass-like leaves give it away. Saffron gatherers appear in Minoan frescos on the island of Santorini in the Aegean Sea. The cup-shaped, solitary, salverform flower tapers off into a narrow tube. Their colors vary enormously, although lilac, mauve, yellow, and white are predominant. The grass-like, ensiform leaf shows generally a white central stripe along the leaf axis. The leaf margin is entire. A crocus has three stamens, while a similar-looking toxic plant, Colchicum, sometimes popularly referred to as "autumn crocus", has six stamens. In addition, crocus have one style, while Colchicum have three. Crocuses are distributed across central and southern Europe, North Africa, Middle East, and Central Asia to western China. The seven species discovered since then have been integrated into this classification. Molecular analysis carried out at the University of Copenhagen suggests this classification should be reviewed. In particular, the DNA data suggest there are no grounds for isolating C. banaticus in its own subgenus Crociris, though it is a unique species in the genus. Because it has a prophyll at the base of the pedicel, it therefore would fall within section Crocus, although its exact relationship to the rest of the subgenus remains unclear. Another anomalous species, C. baytopiorum, should now be placed in a series of its own, series Baytopi. C. gargaricus subsp. herbertii has been raised to species status, as C. herbertii. Perhaps most surprisingly, autumn-flowering C. longiflorus, the type species of series Longiflori (long regarded by Mathew as "a disparate assemblage"), now seems to lie within series Verni. In addition, the position of C. malyi is currently unclear. DNA analysis and morphological studies suggest further that series Reticulati, Biflori and Speciosi are "probably inseparable". C. adanensis and C. caspius should probably be removed from Biflori; C. adanensis falls in a clade with C. paschei as a sister group to the species of series Flavi; C. caspius appears to be sister to the species of series Orientales. The study shows "no support for a system of sections as currently defined", although, despite the many inconsistencies between Mathew's 1982 classification and the current hypothesis, "the main assignment of species to the sections and series of that system is actually supported". The authors state, "further studies are required before any firm decisions about a hierarchical system of classification can be considered" and conclude "future re-classification is likely to involve all infrageneric levels, subgenera, sections and series". Crocus vernus subsp. albiflorus (Kit. ex Schult.) Asch. & Graebn. Crocus ochroleucus Boiss. & Gaill. Crocus moabiticus Bornm. & Dinsmore ex Bornm. Crocus jablanicensis N. Randj. & V. Randj. Crocus biflorus subsp. adamii (J.Gay) K.Richt. Crocus alatavicus Semenova & Reg. Crocus olivieri subsp. istanbulensis B. Mathew, Istanbul, Turkey. C. laevigatus has a long flowering period which starts in late autumn or early winter and may continue into February. About 30 of the species are cultivated, including Crocus sativus for saffron production. The varieties cultivated for decoration mainly represent five species: C. vernus, C. chrysanthus, C. flavus, C. sieberi, and C. tommasinianus. Among the first flowers to bloom in spring, crocuses are popular with gardeners. Their flowering time varies from the late winter C. tommasinianus to the later large hybridized and selected Giant "Dutch crocuses" (C. vernus). Crocus flowers and leaves are protected from frost by a waxy cuticle; in areas where snow and frost occasionally occur in the early spring, it is not uncommon to see early flowering crocuses blooming through a light late snowfall. Most crocus species and hybrids should be planted in a sunny position, in gritty (sandy), well-drained soil, although a few prefer shadier sites in moist soil. Some are suitable for naturalising in grass. The corms should be planted about 3 to 4 cm deep; in heavy soils, a quantity of sharp grit should be worked in to improve drainage. Some crocuses, especially C. tommasinianus and its selected forms and hybrids (such as 'Whitewell Purple' and 'Ruby Giant'), seed prolifically and are ideal for naturalising. They can, however, become weeds in rock gardens, where they will often appear in the middle of choice, mat-forming alpine plants, and can be difficult to remove. Though some true crocuses bloom with the fall (autumnal) rains, after summer's heat and drought, the name autumn crocus is often used as a common name for Colchicum, which is in its own family (Colchicaceae) in the lily order Liliales, and which has six stamens; it is also known as meadow saffron, though unlike true saffron, the plant is toxic. The prairie crocus or pasque flower (Pulsatilla patens) belongs to the buttercup family (Ranunculaceae). The financial community sometimes refers to companies or economic sectors that rise early after an economic downturn as "crocuses" in reference to the flower's ability to thrive in the late winter or early spring. Crocus or Krokus (Greek: Κρόκος) was a mortal youth who, because he was unhappy with his love affair with Smilax, was turned by the gods into a plant bearing his name, the crocus. The crocus flower was used as one of the elements in the emblem of the 2019 FIFA U-20 World Cup in Poland which was unveiled on 14 December 2018. ^ BISHOP, Stephen (2018-04-26). "Krokos Kozanis PDO - European Commission - European Commission". European Commission - European Commission. Retrieved 2018-11-16. ^ Ensiform: Having sharp edges and tapering to a slender point, like a sword blade. ^ A Handbook of Crocus and Colchicum for Gardeners, p. 154, etc. ^ Gitte Petersen, Ole Seberg, Sarah Thorsøe, Tina Jørgensen & Brian Mathew: "A phylogeny of the genus Crocus (Iridaceae) based on sequence data from five plastid regions." Taxon, 57(2), 2008, pp. 487–499. JSTOR 25066017. ^ "Emblem and match schedule for Poland 2019 unveiled". FIFA.com. 14 December 2018. Wikimedia Commons has media related to Crocus. Look up crocus in Wiktionary, the free dictionary. This page was last edited on 19 April 2019, at 18:59 (UTC).